Thailand, a country which never ceases to amaze. Thailand – The people are renowned for their warmth and charm whilst the country is renowned for its ornate temples, ancient pagodas, glorious beaches, stunning mountain scenery, colourful tribes, bustling cities and buzzing nightlife. Thailand truly has something for everyone. Thailand offers a wealth of multi-centre combinations. Most people start in Bangkok, but Thailand's second city Chiang Mai takes you further north to the hill country. The neighbouring Chiang Rai and town of Mae Hong Son offer an introduction into a different part of Thailand with lush, jungle scenery, hill tribe villages and adventure river trips. 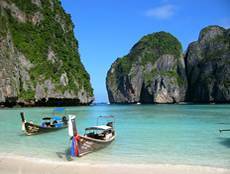 Phuket is probably Thailand’s best known island home to majestic mountains, rainforest and pristine beaches. For those seeking relaxation, there is a dazzling choice of fabulous beaches offering the best of everything from hidden coves, sweeping bays, quiet islands, pulsing nightlife and luxury accommodation. Koh Samui, Phi Phi, Trang, Kho Lanta and Khoa Lak all offer “away from it all“ peaceful Thai locations. Climate: Thailand is such a large country; there is a lot of diversity in the rainfall and weather patterns. The temperature remains warm all year round, never falling lower than 29 degrees Celsius or rising above 36 degrees Celsius. Generally speaking the months of August to October are the wettest and January & February the driest with the optimum months in between but vast expanse of the country provides welcome micro climates. Bo Phut Resort & Spa as a hidden gem, a sister hotel to the more famous Santiburi. It is a beautiful, contemporary resort located on the island's northern tip, 5 km from Samui International Airport and set within 7 acres of splendid tropical gardens by a superb beach. This boutique resort in the charming fishing village of Bo Phut offers a blend of Thai style, modern comforts and gracious hospitality in a quiet location but just 20 minutes from lively Chaweng. All 61 luxurious rooms and villas are designed in a modern Thai style and are extremely well- equipped with separate shower and bath tub, DVD and CD player, well stocked mini bar, satellite TV and in room safe. Sports and recreation facilities include the infinity swimming pool with Jacuzzi, the children’s pool, windsurfing, sailing, kayaking, fitness centre and sauna plus the ability to arrange scuba diving, snorkelling, private boat charters, dinner cruises and sports instructors and as the hotel is the sister property to the larger Santiburi Resort on Mae Nam Beach there is a complimentary shuttle between the two properties should you want to play golf of make a dinner reservation at one of Santiburi’s restaurants.